She not only has a passion for great skin care products, she has a deep love for nature, the outdoors and all things sustainable. Image courtesy of Elemental Herbs, Inc.
RAS: Can you share how your days of being a massage therapist turned into days mixing healing salves? Caroline: My first exposure to the health care industry was on an ambulance as a medic. I quickly realized that emergency medicine created essential fixes for people, but didn’t allow for much healing. I then started exploring alternative treatment modalities to compliment emergency care; this led me to both herbalism and massage therapy. RAS: I read that you spent time living and working on a farm. How did that experience influence the lifestyle you live today. Caroline: Farming is the foundation for all of our life – food. I appreciate what it takes to grow food, and I also love sharing fresh produce with people. I like to watch changes in the land and weather, and to immerse my 3 year old in this experience for her knowledge and skills. Caroline: Great question. My mom is an animal lover, my dad is an historic preservationist and my siblings are earth minded. I think that’s a big part of it. In my childhood, I spent a lot of time in the outdoors and went to a school in Colorado that promoted wilderness survival skills as a part of the education. This gave me appreciation of how to tread lightly. RAS: Your company is extremely devoted to responsible business practices. What benefits can you outline to companies who have not incorporated sustainable methods as of yet. Caroline: Triple Bottom Line practices make a company more fun, more sustainable and more successful for the long term – ultimately, taking care of the environment and people means longevity. There are also many networking opportunities through the green business community. RAS: You use botanicals such as Calendula, Comfrey and Lavender in your products, do you have a favorite botanical? Caroline: No favorites, too many. RAS: Why is using organic grown herbs and non GMO raw materials important when it comes to skin care? Caroline: Organic is always important to prevent the use of harsh chemicals. GMO free is also important for preventing chemicals as well as avoiding raw materials with potentially dangerous and yet unknown effects. RAS: Your products include sun protection, lip products and healing salves, are there new products on the horizon readers can look forward to? Caroline: Moisturizing Line! Organic Infused Coconut Oils and Body Lotions in coconut, lavender and lemongrass. Caroline: Whole Health – ultimately the skin is a reflection of what’s going on in the body, and vice versa – everything we put on the skin goes into the body. So when we care for any one organ, the whole body benefits. RAS: Name 1 or 2 things you do to protect your skin? Caroline: I wear sunscreen daily, and I cover my body in coconut oil after showers. RAS: Are there any skin ailments you suffer with. How do you deal with them? 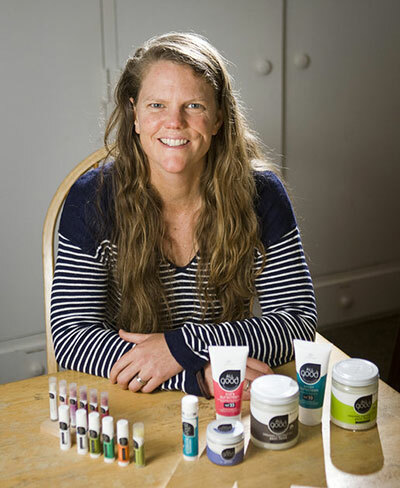 Caroline: I have had basal cell carcinoma on my face – this motivated me to make a safe and effective sunscreen. RAS: What are your 2 must have skin care products you just can’t leave home without? 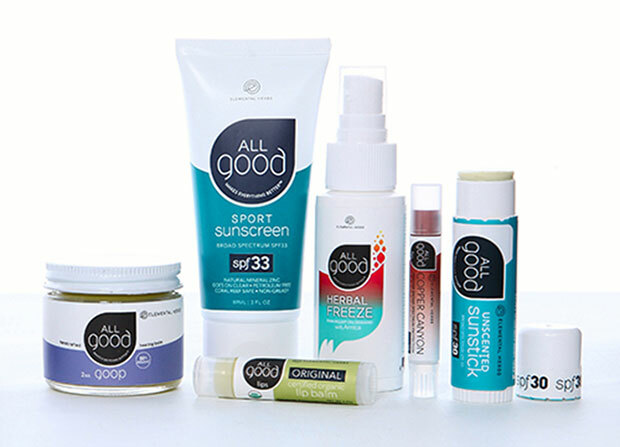 Caroline: All Good Goop and Sunscreen. RAS: In addition to having a love for skin care, do you have any hobbies or other passions you focus your energies on? Caroline: Healing the whole is my greatest passion – approaching my days with an eye for how to benefit people and landscape and oceans. As a family, we also love to engage in activities for our own health like mountain biking, kite surfing, climbing and skiing. Many thanks to Caroline from Elemental Herbs, Inc. for sharing some of your passions and why it's important to shift to sustainable means of living as well as business practices. We already love your zinc oxide sun protection products. If you are a lover of quality, non GMO, ingredient products that also feel good on your skin, sourced through sustainable means and supports the environment, check out Elemental Herbs. 1% of all company revenue supports important global causes through 1% for the Planet.